As long term blog visitors may know, I’m not a cinema fan, so the idea of a ‘Wonder Woman‘ movie was news to me. 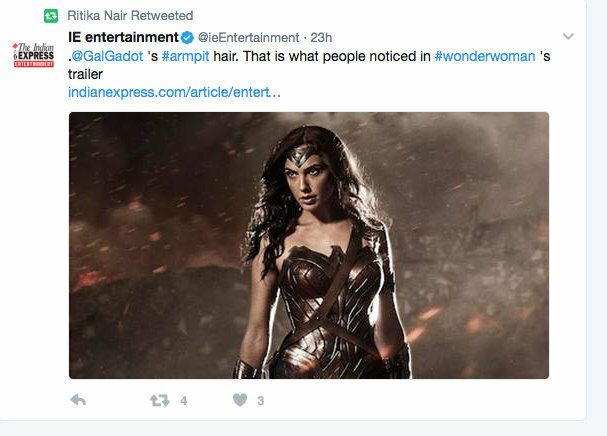 Furthermore, the idea that a Wonder Woman, an Amazonian, with clean shaven armpits was something worth remarking on is even more news to me! I’ve seen re-runs of the 1970s TV version of it, and it appeared to be set in the 1970s, so it was a complete surprise to find that the forthcoming film appears to be set, at least partly, in ancient mythological times, this giving the trailer I’ve seen more of a sense of being a bit Xena: Warrior Princess than I imagined it might be. I won’t go to see it, I don’t think, but my children are getting to an age where ‘superhero’ films capture their imagination, so depending on its classification it might be a summer time trip to the movies. (Incidentally, when researching the post, and Gal Gadot in particular, I read that, most predictably, she was attacked on Twitter for being ‘a Zionist’ (i.e. she did two years compulsory national service in the Israeli Defence Forces). While I identify myself as a feminist, it’s this sort of worthless debate that often leads feminism to ridicule. Where there’s unequal pay for doing many of the same jobs, I imagine that underarm hair, or lack thereof, should be fairly low on a list of feminist priorities. I would wear it almost permanently in SL were it not for the fact that, due to the mechanics of SL, it sometimes ‘disappears’ to be replaced by a different avatar attachment. While I’ve never encountered any negativism from wearing it -on the contrary, male avatars seem fascinated by it and comment positively on it, ditto pubic hair- some of my SL friends have reported comments on how pubic or underarm hair is a ‘turn off’ for males, even within SL! Actually, I just checked on Twitter to see what was being said on there and I wasn’t surprised to find some negativity out there for (female) body hair. Appalling! It’s her body, and her choice to do with it as she pleases, not anyone else’s to tell her how she should ‘dress’ down there. And yeah…Twitter had stuff to say about Gal Gadot’s armpit hair too. It’s our bodies and our right to live how we choose. And the idea of death threats for armpit hairs??? What is wrong with society these days. There are more important things going on in the world that we should care about. Excellent blog. Although I myself might not see the Wonder Woman movie because as a kid from the seventies, there will only be one true Wonder Woman Lynda Carter.